Our Preferred Patron™ Program is perfect for small, medium and large businesses alike. With prices starting at only $69/mo, you'll have no problem finding a well featured program that is priced right for your budget! No hidden fees! No account setup fees. No transaction fees. No redemption fees. Not Ever! There are no long-term commitments required either! Try Preferred Patron™, risk free, for your first two service months. We'll defer your annual agreement until the start of your 3rd service month, at which time you may choose to lock-in your chosen pricing for as long as you maintain service or you may choose to revert to our no-contract monthly service plan. The choice is yours! Pricing shown is based on an annual subscription terms, paid in annual or monthly installments, as well as a no-contract option which can be cancelled at any time. Pricing shown represents the entire price you would pay. There are no hidden transaction or redemption fees! Options and Add-ons are available at additional pricing (see below) but they are not required to operate a successful loyalty program! Call us at 1-800-531-1108 to speak with a representative! No price increases on your monthly subscription plan... Not Ever! 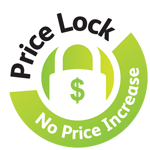 The pricing you lock-in at today will never change, for the life of your subscription! Over the last decade, as our solution has matured and increased in capability, our prices have significantly gone up. Price lock protection shields you from these increases! What's even better, our price lock policy extends to any future subscriptions you might need, as your business grows and prospers over time. It has always been and continues to be our perspective that loyalty marketing technology and services should be tangible for all businesses. We are confident we have a great loyalty marketing solution that will not only fit your budget, but be regarded as an excellent cost to value proposition as well! We encourage you to contact us to discuss which of our loyalty solutions works best for your needs. 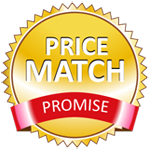 If you have received a better price on a competitive solution, tell us and we will match that price! Simply send us a copy of the competitors' current advertised retail price from a quote you received and we'll match the price. This price match promise applies to our Bronze, Silver and Gold Edition subscription pricing and excludes hardware, accessories and cards. This offer is only available at the time your order is placed, for non-promotional, retail pricing only. We reserve the right to determine if the competitor offering is comparable. 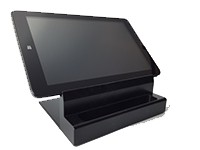 Add a customer-driven or cashier-driven Windows PC tablet with commercial grade stand! Tablets come installed with our special tablet optimized software, have built-in web-cams for reading QR codes, and are delivered pre-installed and ready to run. Tablet stands are constructed from machined aluminum, powder-coated for a maintenance free durable finish, with a built-in card tray for convenient display of your loyalty cards! Tablet devices are priced at $29.95/mo per tablet and stand. Tablets are optional (not required). With 250 character super-sized text messages for a single credit, SMS truly is the most powerful communication channel available! 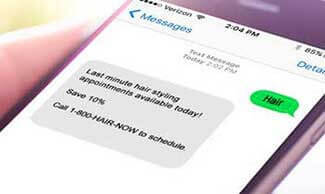 With over a 95% open rate, instant SMS communication drives customer traffic at desired times, influencing shopping behaviors to your advantage. Best part is, Preferred Patron™ incorporates seamless SMS integration! Every subscription includes 1,000 FREE Credits Per Month for bulk advertising. SMS is an optional channel. The purchase of additional SMS text credits is optional and not required. Transactional SMS messages is included FREE! Available only to subscribers in the United States and Canada. Alternate charges may apply for non-USA destination inbound/out SMS. Credit purchases are non-refundable. Monthly plans and pay-as-you-go plans must be chosen from the same plan group. Custom branded cards are highly recommended! They promote your business to the customers who use them, and bystanders who see them, while offering simple access to customer accounts. Custom branded cards, whether credit card style or key chain tags, offer effective and economical advertising. Made from high quality 30 mil laminated PVC, these cards are durable, and are available in credit-card size and/or key-chain tag formations. 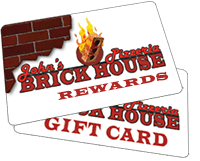 While plastic cards are not required, we strongly believe plastic loyalty cards increase the overall effectiveness of your loyalty program. Custom cards are priced based on order volume. Inquire for pricing. Consider supplementing your loyalty program with transaction receipts. A thermal receipt printer, while not required, adds transaction based loyalty and gift card receipts, which are just one more way to keep your customers informed and engaged. We even offer blue-tooth ready printers for easy connectivity to our loyalty tablets! Barcode and QR code scanners offer ease and efficiency when scanning loyalty and gift cards rather than keying card numbers into the system. Tablets, of course, will leverage the built-in web-cam, so no need for a scanner if you are using a tablet based solution! 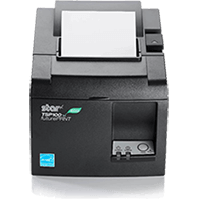 The TSP143 by Star is a high speed thermal receipt printer with auto-cut capability. This is a reliable, high-speed printer compatible with the Preferred Patron™ software! The USB interface connection provides simply, "Plug&Play" installation. 1 Customer limits, above 30K, are only available on Gold Edition. Special rates apply. Inquire for pricing. Gold edition is required for high transaction accounts. 2 Free Preferred Patron™ branded cards are limited to orders of 200 cards per order, maximum 400 cards per month. Custom branded CR-80 Cards, Key-fobs and Combo Cards are recommended for any edition. Pricing shown applies to card-based and card-less systems. Use of third-party cards is not supported unless pre-approved at time of startup. 3 To use bulk SMS features, SMS credits are required. Additional SMS credits may be purchased separately. 4 Pricing, features and terms shown are available for USA and Canada sales only. 5Each brick & mortor location and/or business entity is considered an "Outlet". Bronze Edition is restricted to single outlets. Silver & Gold Editions include a multi-outlet connector, which allows adminstration of the program across all outlets and makes data accessible across all outlets. Individual licenses required for each individual outlet. Outside the USA & Canada (U.K, etc), the following alternate terms apply: (1) SMS Messaging may not be available. If available, pricing may vary by country. (2) There exists a $10.00/mo USD additional surcharge to cover transactional SMS messaging, if available. (3) Tablet rentals, all tablets: Payment Terms - Initial year pre-payment. Terms: (1) Annual agreements take affect the first day of the third billing cycle, affective for 1-year from that date. (2) Introductory pricing will remain in effect for the duration of the annual agreement term plus each subsequent term renewal. (3) Pay-as-you-go monthly commitment terms available at higher rates.